Last weekend marked the start of the SKUSA Winter Series, with its first two rounds run on the AMR Homestead-Miami Motorplex circuit Presented by MG Tires, in South Florida. The perfect occasion for 230 drivers to enter this new year of competition at full speed! The Winter Series, the first event of the 2019 Superkarts! USA sportive season, ran through two days – Round 1 on Saturday, Round 2 on Sunday – with an attendance-list rising up to 230 drivers spread in 11 classes. With a blue sky and warm temperatures, perfect conditions were met to kick off the first round of the 2019 Winter Series. In one of the most driver-packed categories, the PSL Karting X30 Senior, with 53 names, Italy’s Lorenzo Travisanutto (Kart Republic) couldn’t dream of a better introduction to his season when he overtook Ryan Norberg (Kosmic) just a few corners away from the chequered flag, after chasing the polesitter for most of the 25 (!) laps of the race, to grab victory for a mere 0.452 seconds. Canadian Thomas Nepveu (BirelART) finished 7th, Sebastian Montoya (Tony Kart) 10th, and Zane Maloney 15th (Kart Republic) after starting 43th on the grid! In Rolison Performance Group X30 Junior, Luke Lange (Kosmic) had the upper hand in his strong battle against Diego Contecha (Tony Kart) with Santiago Trisini (Kart Republic) arriving in third. The Chuck G Fabrication X30 Master was mostly dominated in Qualifying and Prefinal by Renato David (Tony Kart) before the former SKUSA SuperNationals winner hit a snag in the Final when Rodrigo Piquet (Kart Mini) successfully went for the move in the last lap to win the race in front of David and Scott Roberts (Tony Kart). The Pro Shifter, run for the first time with the brand new 175cc six-gear IAME SSE engine, saw last year’s SKUSA Pro Tour champion AJ Myers (Mad Croc) win for 0.249 seconds ahead of Billy Musgrave (Aluminos), while the Master Shifter class, which uses the same new product brought by the Italian manufacturer, went to reigning Pro Tour S4 champion Jordon Musser (BirelART) who dominated the field in front of Brett Harrelson (CRG). Added for the first time to a Winter Series event, the KA100 Junior (sponsored by Late Apex Kartworks) and Senior (supported by Montoya Racing) categories gave birth to no major surprises as Mateo Rubio-Luengo (Parolin) dominated both Prefinal and Final, the latter with a 4.5-second gap over Dylan Christie (Kosmic), while Colton Ramsey (Tony Kart) grabbed the win in front of Brett Harrelson (CRG) in the Senior classification. The final race of the Orsolon Racing Mini Swift turned into chaos when the leaders Caleb Gafrarar (BirelART) and Kai Sorensen (Tony Kart) hit each other to allow Alex Powell (Energy) and Miguel Costa (Parolin) to fight for a win which, eventually, went to the latter for just 0.299 seconds on the line. In the Medstep Racing Micro Swift, Matias Orjuela (Parolin), backed by his experience, showed no sign of weakness to dominate everything on the way to the Final where his supremacy could have been slightly contested by Beckham Jacir (FA Kart) who proved to be his primary opponent by finishing in a strong second place (+0.398 seconds). For the second season in a row, the Briggs 206 Senior and Master classes were part of the competition. In the Senior, reigning SKUSA Winter Series champion Colin Warren (VLR) took the victory ahead of Matthew Mockabee (Eagle) and Jack Copeland (BirelART). In the Master, Canadian Eli Yanko (Tony Kart) benefited from Dan Breitenstein’s (BirelART) retirement to beat Jorge Ruiz (TB Kart) and Neil Breitenbach (MGM). 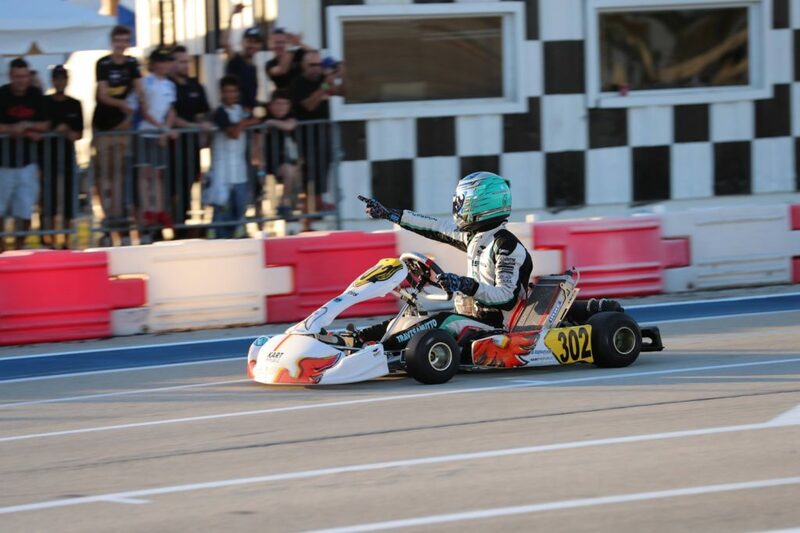 For the second round of the Series, Ryan Norberg (Kosmic) got this time the upper hand to grab the win in the PSL Karting X30 Senior class, a race in which Travisanutto (Kart Republic) finished only fourth following his success on Saturday. Canadian Justin Arseneau (Tony Kart) defeated Saturday’s winner Luke Lange (Kosmic) for a tiny 0.159 seconds to claim his weekend’s best result in the Rolison Performance Group X30 Junior, as did both Jack Copeland (BirelART) in the Briggs 206 Senior, who crossed the line 2.4 seconds in front of Colin Warren (VLR), and Jorge Ruiz (TB Kart), who gained 5 places to win the Master classification of the same race after Round 1 winner Eli Yanko (Tony Kart) faced disqualification. AJ Myers (Mad Croc) kept his winning momentum going with a second consecutive victory in the Pro Shifter class that, unlike Saturday, he dominated with a strong gap of 4.7 seconds ahead of Billy Musgrave (Aluminos). Similarly, Jordon Musser (BirelART) made it two in the Shifter Master category in front of Luke Bhola (Aluminos). Both classes proved successful in their running of the brand new 175cc six-gear IAME SSE engine, put on track for the first time after years of development. Victory smiled again upon Mateo Rubio-Luengo (Parolin) who secured the Late Apex Kartworks KA100 Junior class, while the Montoya Racing Senior classification went to Julia Boos (Tony Kart) with Round 1 victor Colton Ramsey (Tony Kart) chasing her for not much more than a tenth of a second! In Chuck G Fabrication X30 Master, Renato David (Tony Kart) was able to recover from Saturday’s last lap deception when he beat Rodrigo Piquet (Kart Mini) for the Round 2 to conclude a rather fruitful weekend. After losing a potential win in the first round after colliding with Caleb Gafrarar (BirelART), Kai Sorensen (Tony Kart) took his revenge in Sunday’s race of the Orsolon Racing Mini Swift, as well as Beckham Jacir (FA Kart) who built upon his strong second place of the day before to take, this time, the win in the Medstep Racing Micro Swift class. Rounds 3 and 4 of the SKUSA Winter Series will take place again at the Homestead-Miami Motorplex circuit, in South Florida, from February 7th to 10th. Information and results are available on the Superkarts! USA official website.